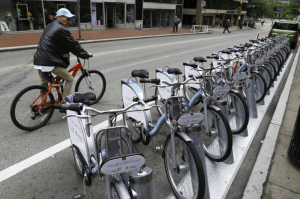 Pittsburgh Bike Share will offer unlimited 15-minute bike rides for Port Authority ConnectCard holders through March 31. The company operates 50 Healthy Ride bike share stations throughout the city. Riders will use their ConnectCards to unlock bikes. Two stations in the Golden Triangle were set up to use the cards when the program was rolled out on Sept. 28, and the rest should be enabled this week as Pittsburgh Bike Share implements a technology upgrade.